I read the little blurb on "Reipas" and got to thinking that I used to belong to the FAC "Nahjus", which was a boy's club back in the '50s. I think that Toivo "Toik" Viitanen had something to do in the leadership of it but can't think of the other instructor's name. Actually there was quite a bit of equipment there as I can remember them setting up different apparatus on different occasions. Besides the rings we also had the high bar, the parallel bars, the pummel horse w/springboard, and even a trampoline. There were gym mats and various balls so that we could play "dodge the ball" or throw the medicine ball which was almost too heavy for us little tykes to throw. We would learn to do tumbling, (somersaults, forward and backward rolls, cartwheels, handstands, headstands). We did calisthenics and various other floor exercises. 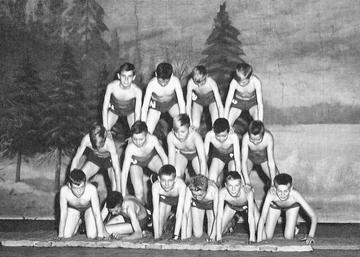 We would perform at various ethnic Christmas parties for youth by doing "pyramids", tumbling exercises, or the pummel horse with the springboard. Sometimes when the "Laulujuhlat" were in Port Arthur we would perform at "Pikkujoki" or "Three Mile Creek" as we used to know it. During a couple of winters we would meet bright and early at the Finn Hall and get a ride over to the "Y" in Fort William where we would go for an hour's swim in the pool.